Two women, Temitope Abigeal and Temitope Remi, have been arraigned before a Chief Magistrate’s Court in Ebute Meta on a three count of conspiracy, assault and grievous harm. 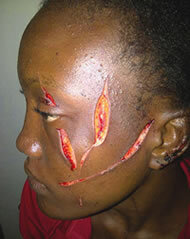 Abigeal (26) and Remi (28), choristers at a Cherubim and Seraphim church at Ebute Meta, were alleged to have assaulted Hannah Okurabe (18) with razor blades at Abule Nla junction, a few metres away from the church. The incident was said to be the result of an earlier fight over the church’s choirmaster, Joseph Unuigbe, a father of two. Joseph Unuigbe is married to a lady who is also a member of the same church. Hannah is presently receiving treatment at the Lagos Island General Hospital, while Abigeal and Remi have been remanded in Kirikiri until they meet their bail terms.